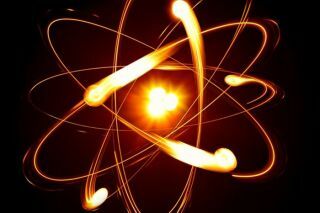 As far as physicists currently know, electrons have no internal structure — and thus no shape in the classical meaning of this word. In the modern language of particle physics, which tackles the behavior of objects smaller than an atomic nucleus, the fundamental blocks of matter are continuous fluid-like substances known as "quantum fields" that permeate the whole space around us. In this language, an electron is perceived as a quantum, or a particle, of the "electron field." Knowing this, does it even make sense to talk about an electron's shape if we cannot see it directly in a microscope — or any other optical device for that matter? Simply put, we define shapes by seeing how objects react when we shine light onto them. While this might be a weird way to think about the shapes, it becomes very useful in the subatomic world of quantum particles. It gives us a way to define an electron's properties such that they mimic how we describe shapes in the classical world. What replaces the concept of shape in the micro world? Since light is nothing but a combination of oscillating electric and magnetic fields, it would be useful to define quantum properties of an electron that carry information about how it responds to applied electric and magnetic fields. Let's do that. As an example, consider the simplest property of an electron: its electric charge. It describes the force — and ultimately, the acceleration the electron would experience — if placed in some external electric field. A similar reaction would be expected from a negatively charged marble — hence the "charged ball" analogy of an electron that is in elementary physics books. This property of an electron — its charge — survives in the quantum world. Likewise, another "surviving" property of an electron is called the magnetic dipole moment. It tells us how an electron would react to a magnetic field. In this respect, an electron behaves just like a tiny bar magnet, trying to orient itself along the direction of the magnetic field. While it is important to remember not to take those analogies too far, they do help us see why physicists are interested in measuring those quantum properties as accurately as possible. What quantum property describes the electron's shape? There are, in fact, several of them. The simplest — and the most useful for physicists — is the one called the electric dipole moment, or EDM. In classical physics, EDM arises when there is a spatial separation of charges. An electrically charged sphere, which has no separation of charges, has an EDM of zero. But imagine a dumbbell whose weights are oppositely charged, with one side positive and the other negative. In the macroscopic world, this dumbbell would have a non-zero electric dipole moment. If the shape of an object reflects the distribution of its electric charge, it would also imply that the object's shape would have to be different from spherical. Thus, naively, the EDM would quantify the "dumbbellness" of a macroscopic object. These virtual particles form a "cloud" around an electron. If we shine light onto the electron, some of the light could bounce off the virtual particles in the cloud instead of the electron itself. This would change the numerical values of the electron's charge and magnetic and electric dipole moments. Performing very accurate measurements of those quantum properties would tell us how these elusive virtual particles behave when they interact with the electron and if they alter the electron's EDM. Most intriguing, among those virtual particles there could be new, unknown species of particles that we have not yet encountered. To see their effect on the electron's electric dipole moment, we need to compare the result of the measurement to theoretical predictions of the size of the EDM calculated in the currently accepted theory of the Universe, the Standard Model. So far, the Standard Model accurately described all laboratory measurements that have ever been performed. Yet, it is unable to address many of the most fundamental questions, such as why matter dominates over antimatter throughout the universe. The Standard Model makes a prediction for the electron's EDM too: it requires it to be so small that ACME would have had no chance of measuring it. But what would have happened if ACME actually detected a non-zero value for the electric dipole moment of the electron? Alternatively, we could see how those new particles alter the charge distribution in the "cloud" and their effect on electron's EDM. Thus, unambiguous observation of electron's dipole moment in ACME experiment would prove that new particles are in fact present. That was the goal of the ACME experiment. This is the reason why a recent article in Nature about the electron caught my attention. Theorists like myself use the results of the measurements of electron's EDM — along with other measurements of properties of other elementary particles — to help to identify the new particles and make predictions of how they can be better studied. This is done to clarify the role of such particles in our current understanding of the universe. What should be done to measure the electric dipole moment? We need to find a source of very strong electric field to test an electron's reaction. One possible source of such fields can be found inside molecules such as thorium monoxide. This is the molecule that ACME used in their experiment. Shining carefully tuned lasers at these molecules, a reading of an electron's electric dipole moment could be obtained, provided it is not too small. However, as it turned out, it is. Physicists of the ACME collaboration did not observe the electric dipole moment of an electron — which suggests that its value is too small for their experimental apparatus to detect. This fact has important implications for our understanding of what we could expect from the Large Hadron Collider experiments in the future. A short animation describing the physics behind EDM and ACME collaboration's findings.